I know a lot of you grew up at Stockton 99 Stadium. 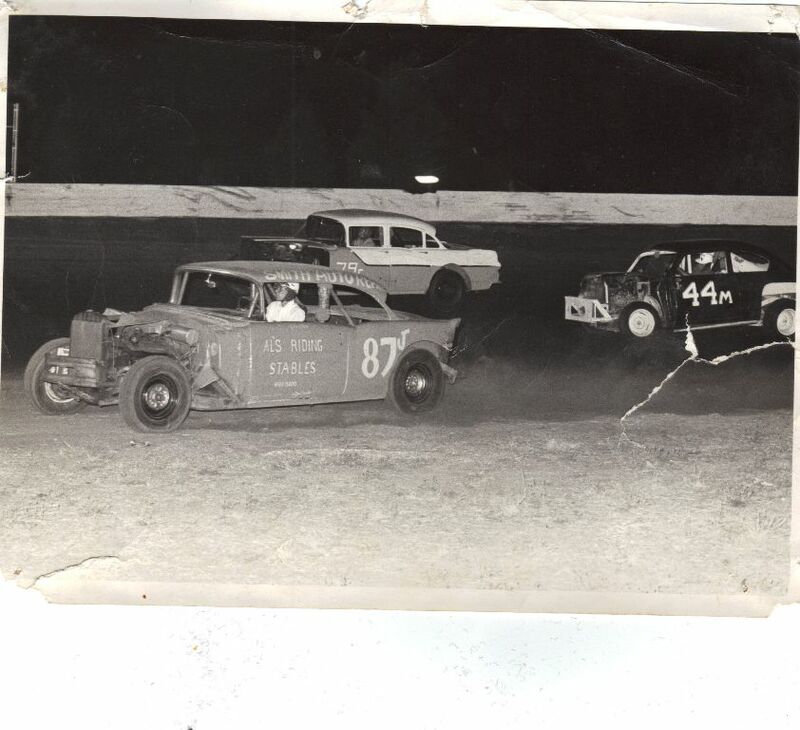 I know I can recall being sat down with somebody my folks knew, as they worked at the track every Friday or Saturday night. In the 60's. 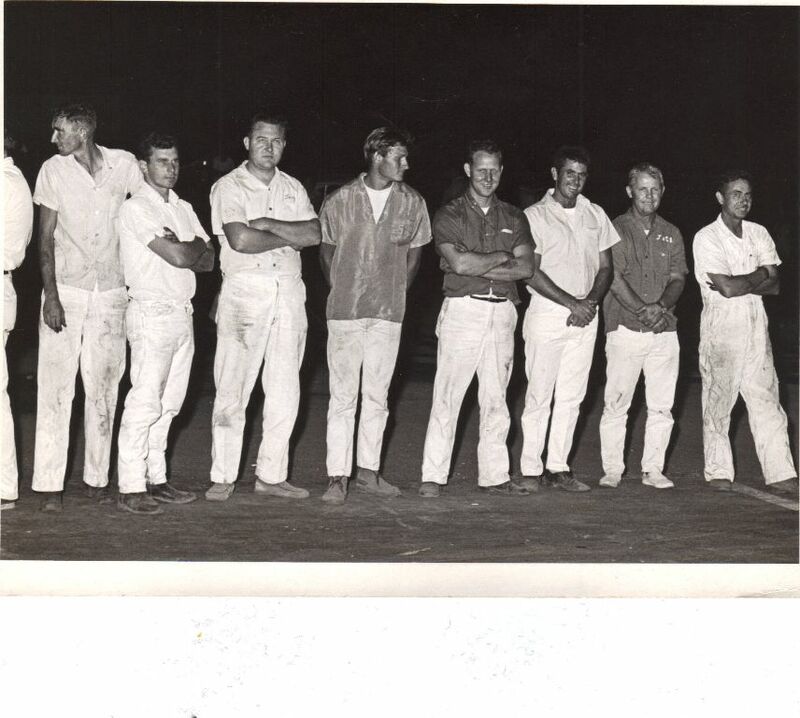 I remember bringing my Little League team to the track for our season ending party, finding out that our best pitchers uncle was Clyde Barnec! (sp?). 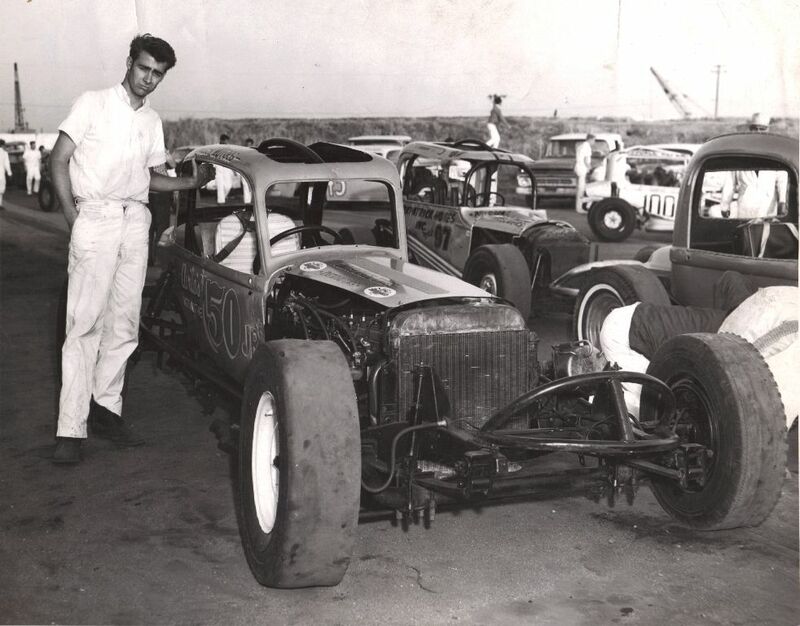 So many local connections, I know the spirit of the track is still out there. George's pictures really sent me back. They're exactly what I remember, and I haven't seen so many high quality pictures! So many thanks to George and his family! Check out these pictures, they're really something. 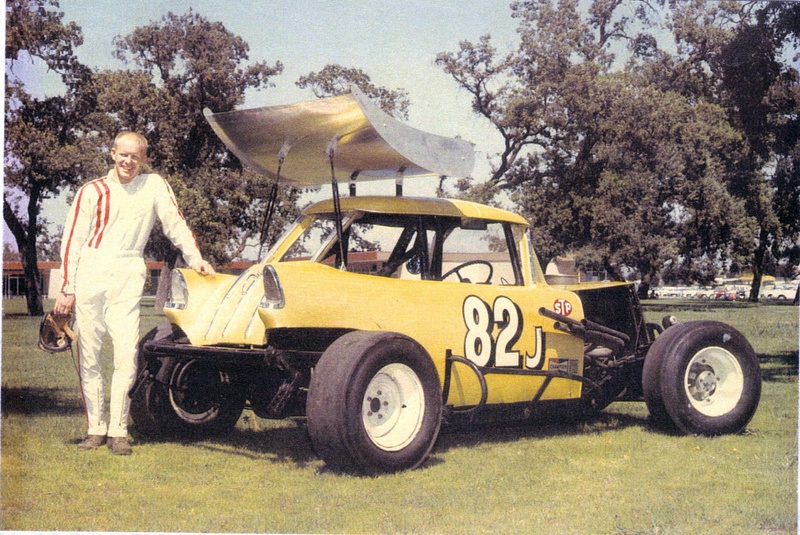 If you have any pictures you'd like to share and add to our rich history, please email me at: 99speedway@stockton99speedway.com. Click the pictures to enlarge. Enjoy! 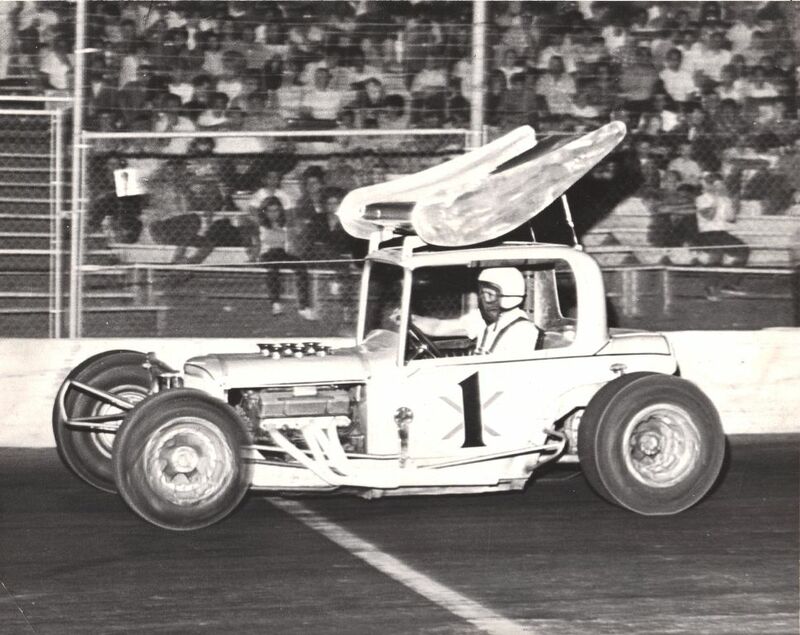 Curtis Ervan drove for Blackie Avila in June of 1965 in 99’s modified division. 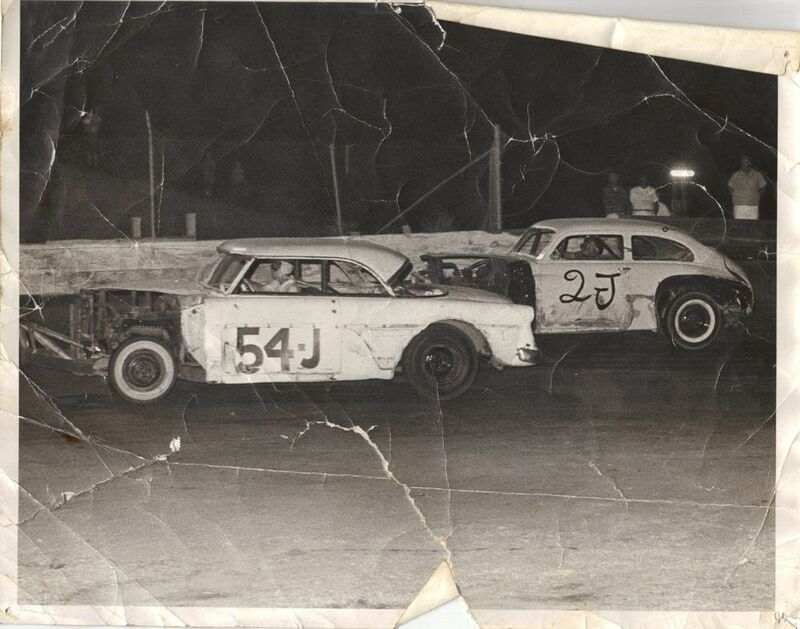 Vel Rogers runs a flathead V8 and Dennis Hicks #52 runs a 6 cylinder in 99’s modified division. 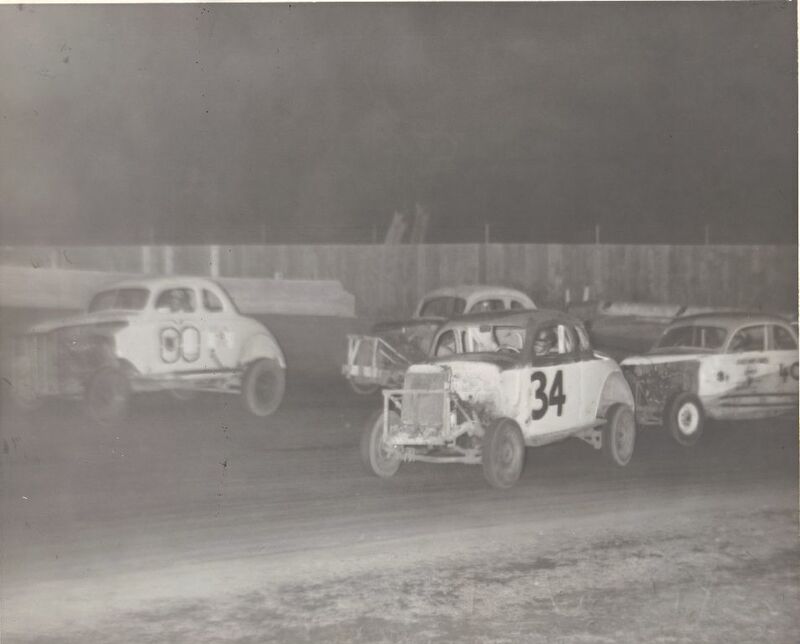 Dennis Hicks is in the middle of a group of modified drivers. Can you help us name them all? 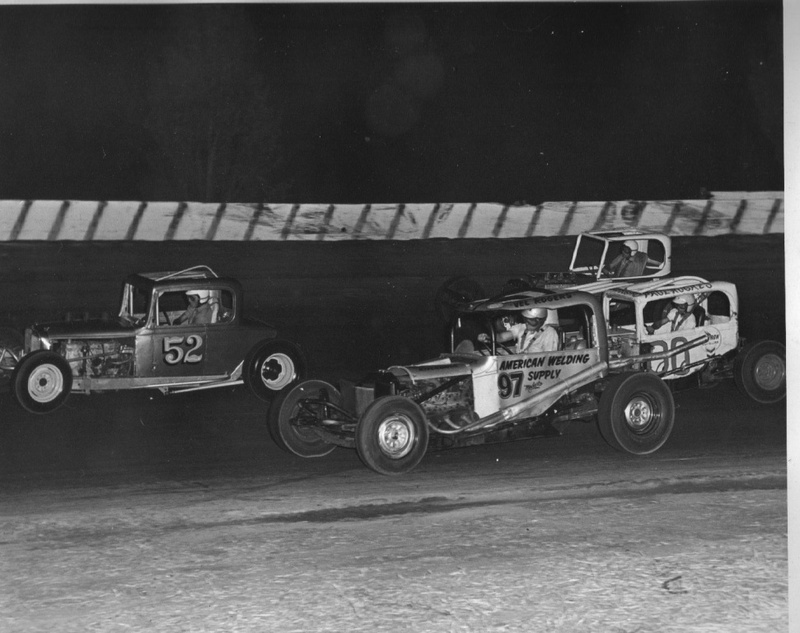 Another division at 99 in the 60’s was the Claimers who usually ran heats, trophy dashes, a semi and a main event. 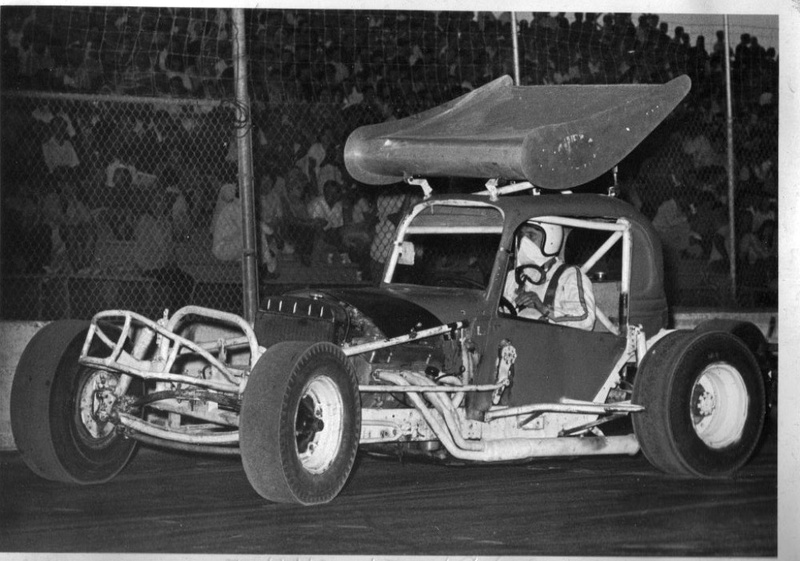 Dennis Hicks #52 runs a Chevy small bock V8 in 99’s modified division. 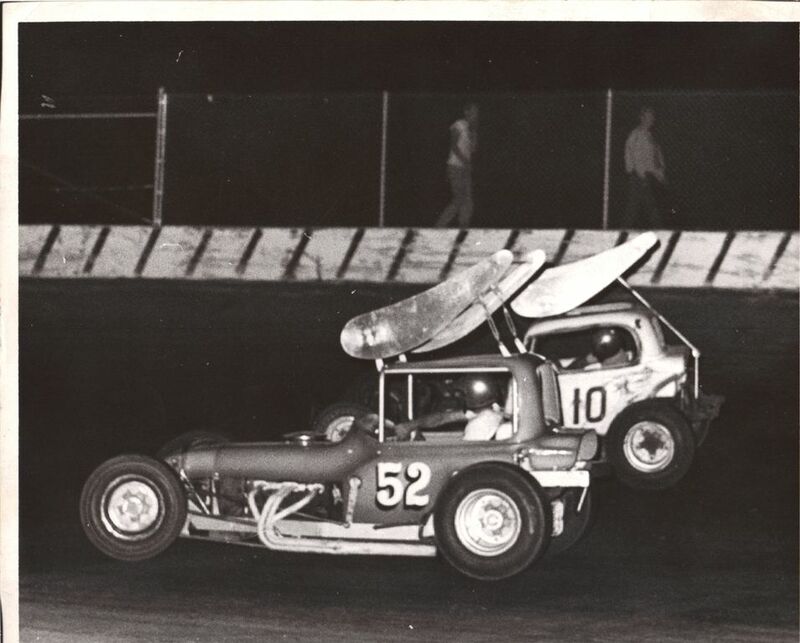 Donnie “Hoppin Hick” Hickman in the middle of turn 3 &4 gets ready to dive down the front straightaway in the 60’s modified photo. 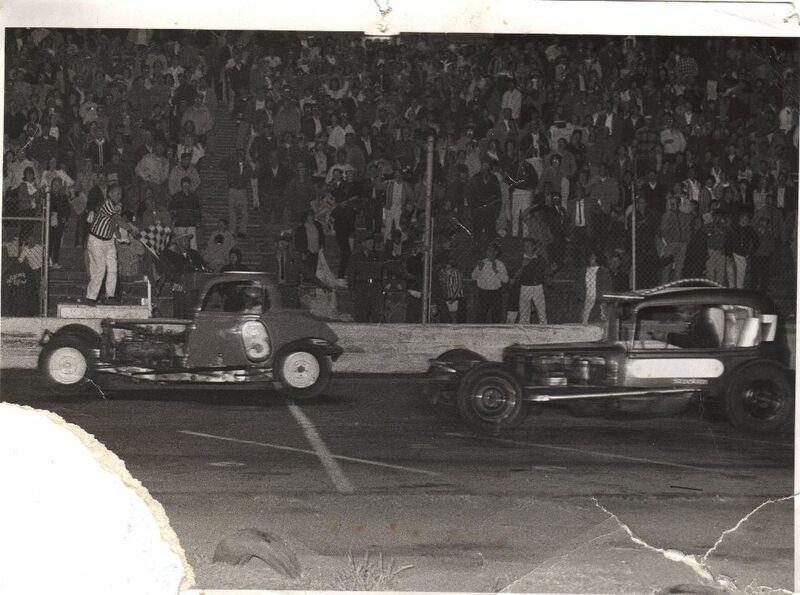 Fred Hunt #8 in his Chevy modified races a ford in turn 4, circa 1966. In turn 3, these “heavy duty” Hard Tops are pre-bent tubing design. Hardtops and Modified were the two class programs I remember as a kid. These Hardtops were the backyard mechanics dream car. I'll bet their innovative ideas led to discoveries used today on ovals around America! 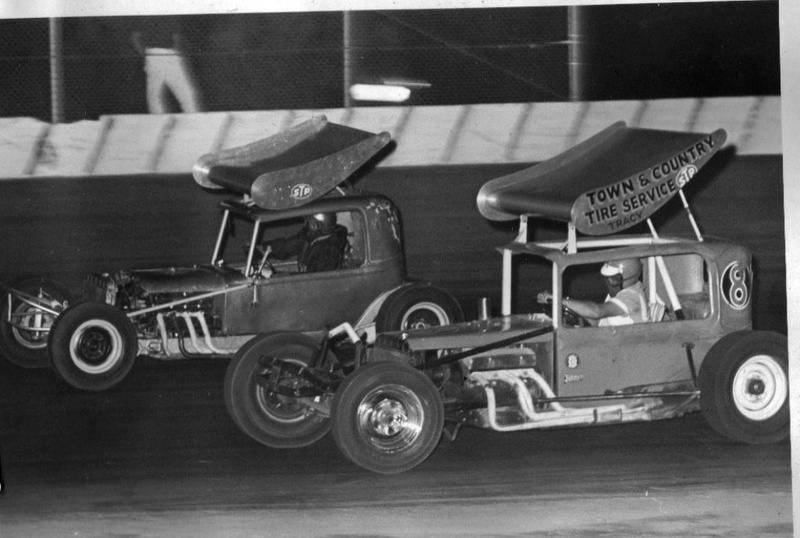 Even Jack McCoys' #7 toilet paper sponsor can’t absorb this smoky spin at 99 speedway. 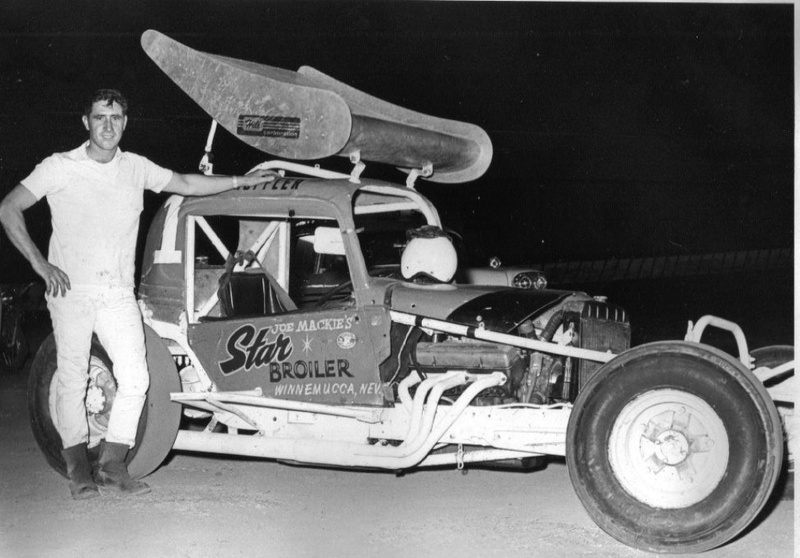 Johnny Brazil next to the Star Broiler #1 from Manteca. 1-29-1966. 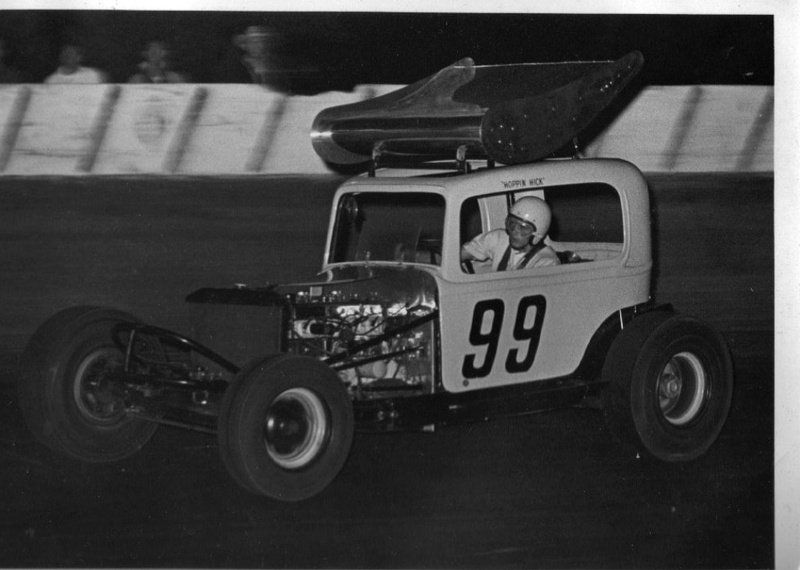 June 16, 1966 Johnny Brazil of Manteca drives down the front stretch at 99 speedway. 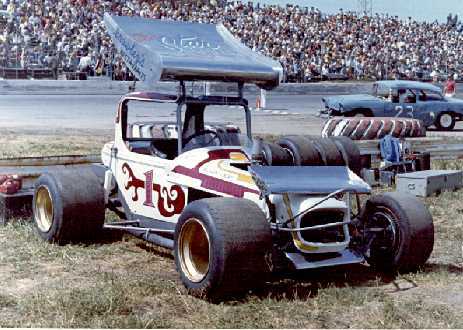 Johnny Brazil also drove super modified at Stockton 99, notice six carburetors coming up through the hood. 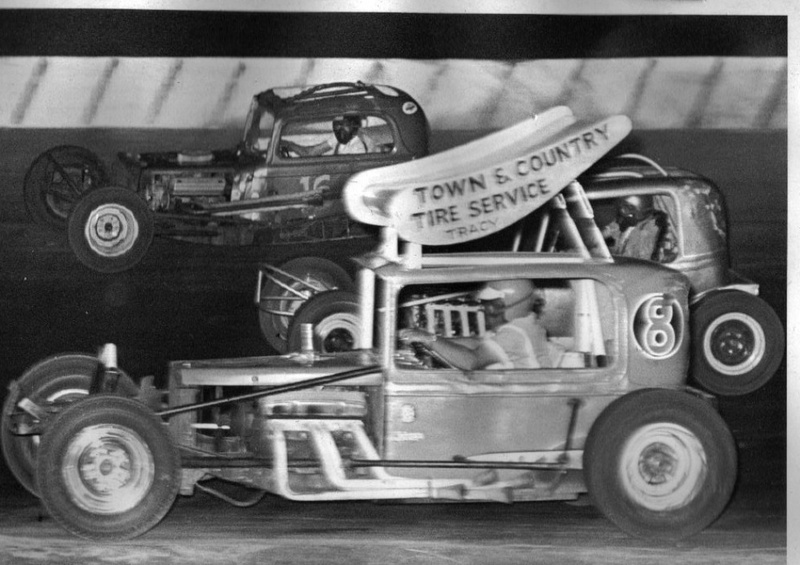 Open Comps were an annual event at 99, allowing the supers to run. 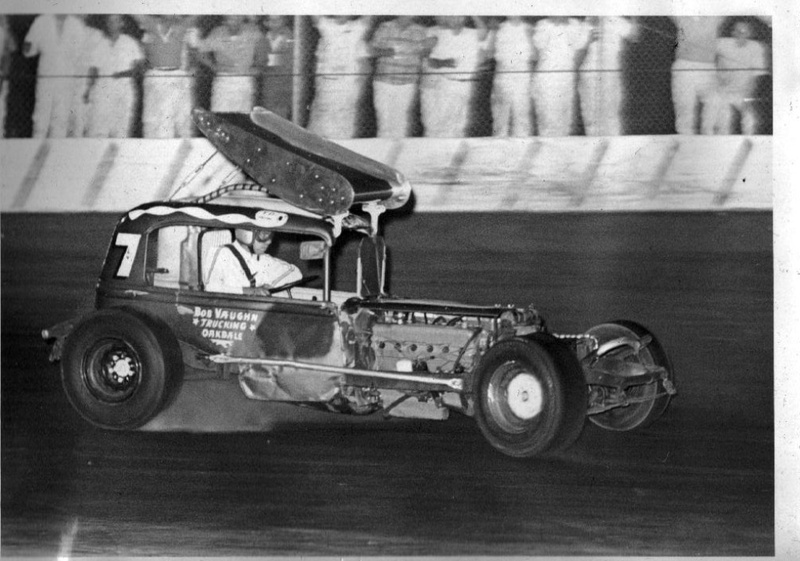 Johnny holds the all-time quickest lap record at 99 at 11.899, set in a super modified 6-1-85. 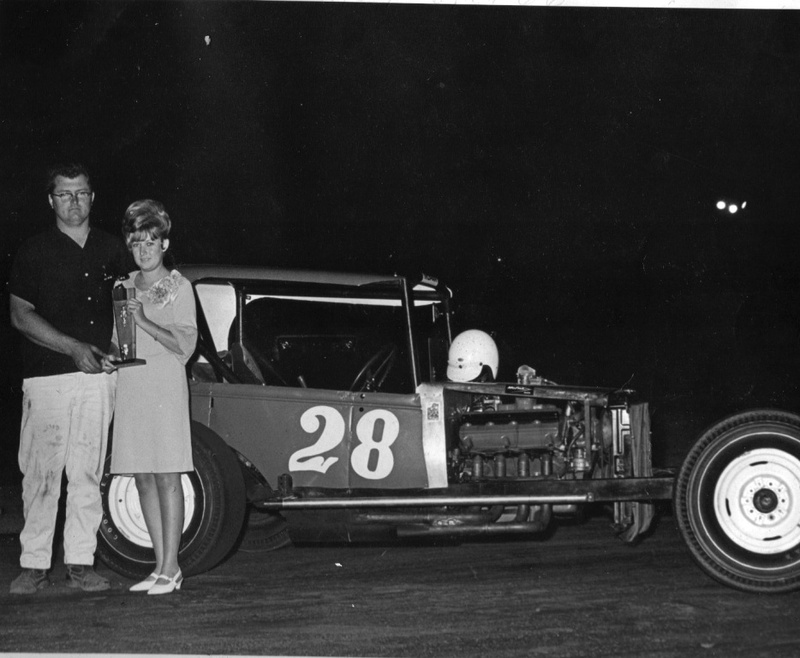 #28 ford powered Joe Rushton in 1966 receiving the trophy dash trophy and no doubt a kiss in 1966. 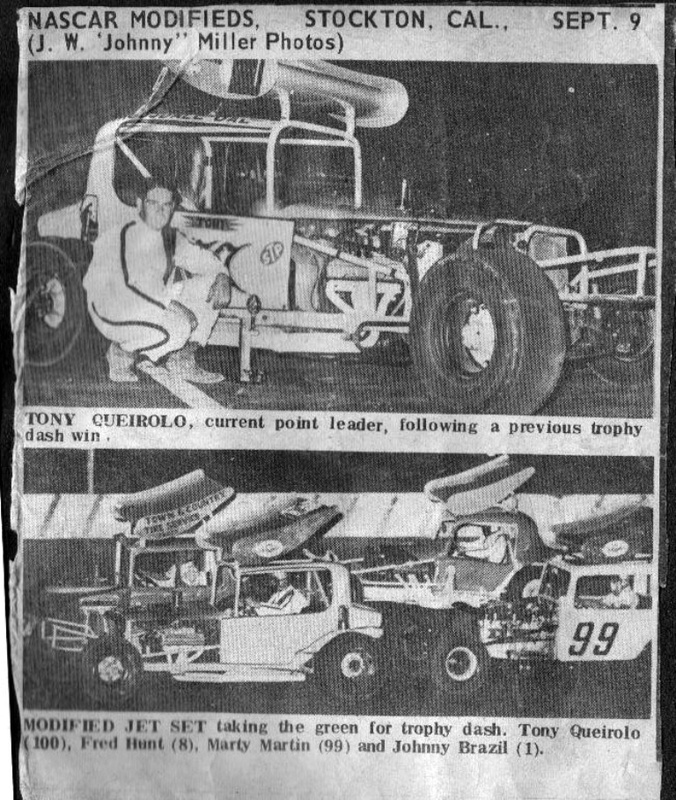 Tony Quierolo, #100 from Tracy, was at 99 every Friday night to race Brazil, Hicks, Hunt, Rushton, Hickman and McCoy, plus many others in the modified Division. Well, I hope you enjoyed this first edition of our rich history. There's lots more to come. Let me know what you think, send emails and pictures! !